When you book our ice cream van hire service, we want to give you and your guests the ultimate ice cream experience! We look at many factors. This will include the type of event, the venue, how many guests there will be and any personal requests. We plan our ice cream menu before each event. By doing this we make sure it suits your budget and tastes. If there is a particular product you would like, please let us know when booking. if you have any allergy concerns then please let us know before so we can accommodate them. We offer branded and top quality ice creams and lollies. Whether you are looking for Mr Whippy or gelato, we can help. Our modern and vintage ice cream vans stock a wide range of products and all the favourites you and your guests would expect. For more information why not have a look at our ice cream van menus? Our friendly staff will deliver the very best in customer service to ensure that you and your guests are happy. We have many years experience in attending all types of event and are proud to say that our customers return year upon year. 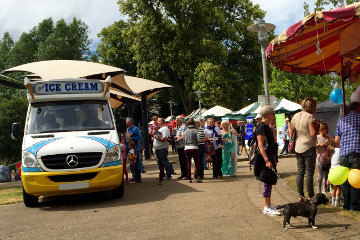 We provide ice cream vans for fetes, fairs, festivals and more. We cover all types of event. Across Surrey, Berkshire, Middlesex, London and South UK. 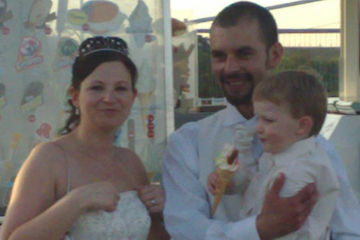 Hire an ice cream van van for your special day. Wedding breakfast, ceremony or photos. We offer a range of menu options to suit every budget. 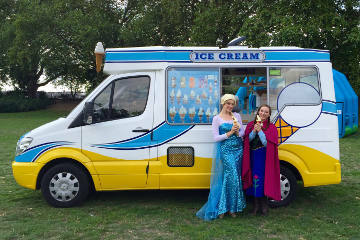 Delight the kids - why not hire an ice cream van for their birthday party? Treat their friends to an ice cream and the birthday child can help serve! We supply ice cream vans for all sporting events. Great rates of commission paid for Football Tournaments, Rugby Minis Festivals and School Sports Days! "Just to say a Big Thank you for coming along to the show and help to raise funds for the charity"
"Just a quick line to say thank you very much for the donation we have received from you...It is very much appreciated and helps to make a great difference to the deaf people we as a charity help." "Many thanks for your ice cream services today - I've received positive feedback from many employees!" "Thanks for today Joe. The kids had a great time and loved your ice cream as usual. And so did we!!" "A big thank you, once again, to you all, for helping to make our event such a success." "I just wanted to say a big thank you for serving the ice creams at my party. This element of the night will be talked about for ever - the most I think one of my guests had was 5!! It was so funny seeing so many friends on the dance floor with 99s!!" "I just wanted to contact you on behalf of everyone at Leukaemia & Lymphoma Research and say a huge thank you for all your support and your very generous donation which you have given the charity"
"It was lovely to meet you on Sunday. Thank you so much for coming along to our event... I will certainly be in contact if we require an ice-cream van at any future events." NB. If you would like a quote, please include the date and location of your event and the approx. no of guests/ice creams you require. Thank you! I consent to Mantio Ice Cream storing my submitted information so they can respond to my enquiry. 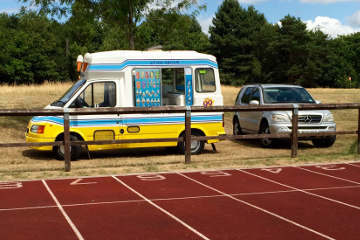 Mantio Ice Cream has covered Heathside School sports day for many years. They are extremely reliable, affordable prices (especially for students) with amazingly tasty ice cream and wide choice of lollies as well. As a PTA we benefit with a generous donation with no worries or organisation apart from booking the date! Highly recommended for any event. 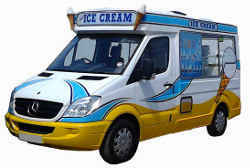 Ice cream is amazing, van is always spotless and the nicest ice cream man around.. highly recommended ? © 2018 Mantio Ice Cream | Ice cream Van Hire in Surrey and South East. All Rights Reserved.